An invitation must accompany payment of the bill so that the 10% of the bill will be earmarked for the fundraiser. Invitations are available at the Library’s Circulation Desk and on the library’s website http://library.indstate.edu . Make sure all your friends have an invitation. Everyone is invited to come to BW3’s to enjoy a nice evening out while at the same time making a donation to Haitian relief. 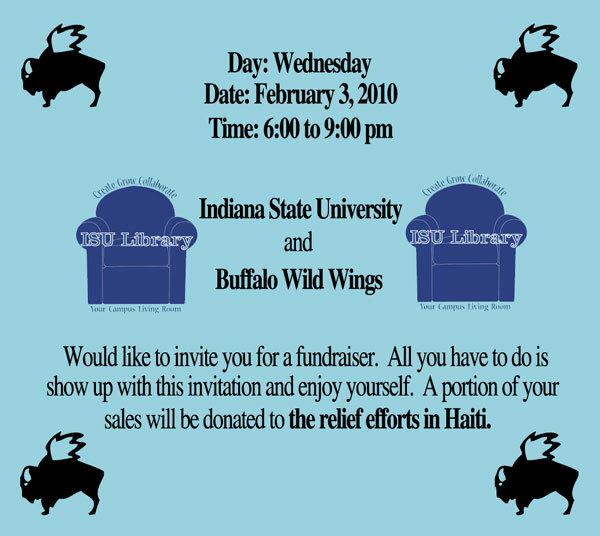 Come help the survivors of Haiti’s earthquake. Funds will go directly to Mountain Top Ministries in Gramothe, Haiti. (You can read more what is going on at the mission’s website at: http://www.mtmhaiti.com/) . DROP CHANGE IN THE BIG JAR! Beginning Monday, Feb. 1, a large jar will be placed on the front desk in the Library Dean’s Office, which is located just past the checkout desk. For the next two weeks, people across campus are encouraged to stop by the library and drop in some change (or larger amounts) in the jar. On Friday, February 12, all proceeds will be sent directly to Mountain Top Ministries in Gramothe, Haiti. Why this particular organization? One of the founders is from a nearby town. One library staff member, Paul Asay, has visited Haiti 3 times to help and the Library has had fund-raisers to help build a library. Another staff member, Beverly Grubb, has a granddaughter that was adopted in Haiti and the Ministries helped the family get through some of the red tape. Check out the Travel through Time with Wabash Valley & Voices video accessible on the WV3 homepage http://visions.indstate.edu. This promotional video will be distributed to schools throughout the Valley to encourage educators to use the primary source material in the classroom.